These highlights do not include all the information needed to use RAPAFLO® safely and effectively. See full prescribing information for RAPAFLO. RAPAFLO, an alpha-1 adrenergic receptor antagonist, is indicated for the treatment of the signs and symptoms of benign prostatic hyperplasia (BPH). (1) RAPAFLO is not indicated for the treatment of hypertension. To report SUSPECTED ADVERSE REACTIONS, contact Watson Pharmaceuticals, Inc. at 1-800-272-5525 or FDA at 1-800-FDA-1088 or www.fda.gov/medwatch. RAPAFLO, a selective alpha-1 adrenergic receptor antagonist, is indicated for the treatment of the signs and symptoms of benign prostatic hyperplasia (BPH) [see Clinical Studies (14)]. RAPAFLO is not indicated for the treatment of hypertension. Renal impairment: RAPAFLO is contraindicated in patients with severe renal impairment (CCr < 30 mL/min). In patients with moderate renal impairment (CCr 30-50 mL/min), the dose should be reduced to 4 mg once daily taken with a meal. No dosage adjustment is needed in patients with mild renal impairment (CCr 50-80 mL/min) [see Contraindications (4), Warnings and Precautions (5.2), Use in Specific Populations (8.6), and Clinical Pharmacology (12.3)]. Hepatic impairment: RAPAFLO has not been studied in patients with severe hepatic impairment (Child-Pugh score > 10) and is therefore contraindicated in these patients. No dosage adjustment is needed in patients with mild or moderate hepatic impairment [see Contraindications (4), Warnings and Precautions (5.3), Use in Specific Populations (8.7), and Clinical Pharmacology (12.3)]. 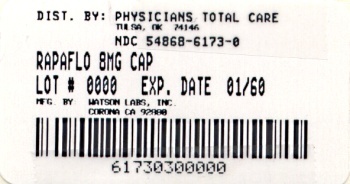 The 8 mg capsules are white, opaque, hard #1 gelatin capsules imprinted with â€œWATSON 152â€ in green on the cap and â€œ8 mgâ€ in green on the body. The 4 mg capsules are white, opaque, hard #3 gelatin capsules imprinted with â€œWATSON 151â€ in gold on the cap and â€œ4 mgâ€ in gold on the body. Postural hypotension, with or without symptoms (e.g., dizziness) may develop when beginning RAPAFLO treatment. As with other alpha-blockers, there is potential for syncope. Patients should be cautioned about driving, operating machinery, or performing hazardous tasks when initiating therapy [see Adverse Reactions (6), Use in Specific Populations (8.5), Clinical Pharmacology (12.2), and Patient Counseling Information (17)]. In a clinical pharmacology study, plasma concentrations (AUC and Cmax) of silodosin were approximately three times higher in subjects with moderate renal impairment compared with subjects with normal renal function, while half-lives of silodosin doubled in duration. 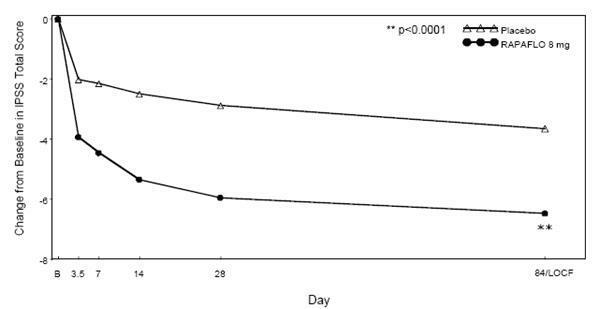 The dose of RAPAFLO should be reduced to 4 mg in patients with moderate renal impairment. Exercise caution and monitor such patients for adverse events [see Use in Specific Populations (8.6) and Clinical Pharmacology (12.3)]. RAPAFLO is contraindicated in patients with severe renal impairment [see Contraindications (4)]. RAPAFLO has not been tested in patients with severe hepatic impairment, and therefore, should not be prescribed to such patients [see Contraindications (4), Use in Specific Populations (8.7) and Clinical Pharmacology (12.3)]. In a drug interaction study, co-administration of a single 8 mg dose of RAPAFLO with 400 mg ketoconazole, a strong CYP3A4 inhibitor, caused a 3.8-fold increase in maximum plasma silodosin concentrations and 3.2-fold increase in silodosin exposure (i.e., AUC). Concomitant use of ketoconazole or other strong CYP3A4 inhibitors (e.g., itraconazole, clarithromycin, ritonavir) is therefore contraindicated [see Drug Interactions (7.1)]. The pharmacodynamic interactions between silodosin and other alpha-blockers have not been determined. However, interactions may be expected, and RAPAFLO should not be used in combination with other alpha-blockers [see Drug Interactions (7.3)]. A specific pharmacodynamic interaction study between silodosin and antihypertensive agents has not been performed. However, patients in the Phase 3 clinical studies taking concomitant antihypertensive medications with RAPAFLO did not experience a significant increase in the incidence of syncope, dizziness, or orthostasis. Nevertheless, exercise caution during concomitant use with antihypertensives and monitor patients for possible adverse events [see Adverse Reactions (6.1) and Drug Interactions (7.6)]. Caution is also advised when alpha-adrenergic blocking agents including RAPAFLO are co-administered with PDE5 inhibitors. Alpha-adrenergic blockers and PDE5 inhibitors are both vasodilators that can lower blood pressure. Concomitant use of these two drug classes can potentially cause symptomatic hypotension [see Drug Interactions (7.5)]. Intraoperative Floppy Iris Syndrome has been observed during cataract surgery in some patients on alpha-1 blockers or previously treated with alpha-1 blockers. This variant of small pupil syndrome is characterized by the combination of a flaccid iris that billows in response to intraoperative irrigation currents; progressive intraoperative miosis despite preoperative dilation with standard mydriatic drugs; and potential prolapse of the iris toward the phacoemulsification incisions. Patients planning cataract surgery should be told to inform their ophthalmologist that they are taking RAPAFLO [see Adverse Reactions (6.1)]. In a clinical metabolic inhibition study, a 3.8-fold increase in silodosin maximum plasma concentrations and 3.2-fold increase in silodosin exposure were observed with concurrent administration of a strong CYP3A4 inhibitor, 400 mg ketoconazole. Use of strong CYP3A4 inhibitors such as itraconazole or ritonavir may cause plasma concentrations of silodosin to increase. Concomitant administration of strong CYP3A4 inhibitors and RAPAFLO is contraindicated [see Contraindications (4), Warnings and Precautions (5.4) and Clinical Pharmacology (12.3)]. In vitro studies indicated that silodosin is a P-gp substrate. Ketoconazole, a CYP3A4 inhibitor that also inhibits P-gp, caused significant increase in exposure to silodosin. Inhibition of P-gp may lead to increased silodosin concentration. RAPAFLO is therefore not recommended in patients taking strong P-gp inhibitors such as cyclosporine [see Clinical Pharmacology (12.3)]. The pharmacodynamic interactions between silodosin and other alpha-blockers have not been determined. However, interactions may be expected, and RAPAFLO should not be used in combination with other alpha-blockers [see Warnings and Precautions (5.5)]. The pharmacodynamic interactions between silodosin and antihypertensives have not been rigorously investigated in a clinical study. However, approximately one-third of the patients in clinical studies used concomitant antihypertensive medications with RAPAFLO. The incidence of dizziness and orthostatic hypotension in these patients was higher than in the general silodosin population (4.6% versus 3.8% and 3.4% versus 3.2%, respectively). Exercise caution during concomitant use with antihypertensives and monitor patients for possible adverse events [see Warnings and Precautions (5.5)]. The effect of a moderate fat, moderate calorie meal on silodosin pharmacokinetics was variable and decreased silodosin maximum plasma concentration (Cmax) by approximately 18 âˆ’ 43% and exposure (AUC) by 4 âˆ’ 49% across three different studies. Safety and efficacy clinical trials for RAPAFLO were always conducted in the presence of food intake. Patients should be instructed to take silodosin with a meal to reduce risk of adverse events [see Clinical Pharmacology (12.3)]. In double-blind, placebo-controlled, 12-week clinical studies of RAPAFLO, 259 (55.6%) were under 65 years of age, 207 (44.4%) patients were 65 years of age and over, while 60 (12.9%) patients were 75 years of age and over. Orthostatic hypotension was reported in 2.3% of RAPAFLO patients < 65 years of age (1.2% for placebo), 2.9% of RAPAFLO patients > 65 years of age (1.9% for placebo), and 5.0% of patients > 75 years of age (0% for placebo). There were otherwise no significant differences in safety or effectiveness between older and younger patients [see Clinical Pharmacology (12.3)]. RAPAFLO has not been studied in patients with severe renal impairment. RAPAFLO is contraindicated in patients with severe renal impairment [see Contraindications (4), Warnings and Precautions (5.2) and Clinical Pharmacology (12.3)]. RAPAFLO has not been studied in patients with severe hepatic impairment. RAPAFLO is contraindicated in patients with severe hepatic impairment [see Contraindications (4), Warnings and Precautions (5.3) and Clinical Pharmacology (12.3)]. A test for postural hypotension was conducted 2 to 6 hours after the first dose in the two 12-week, double-blind, placebo-controlled clinical studies. After the patient had been at rest in a supine position for 5 minutes, the patient was asked to stand. Blood pressure and heart rate were assessed at 1 minute and 3 minutes after standing. A positive result was defined as a > 30 mmHg decrease in systolic blood pressure, or a > 20 mmHg decrease in diastolic blood pressure, or a > 20 bpm increase in heart rate [see Warnings and Precautions (5.1)]. The effect of RAPAFLO on QT interval was evaluated in a double-blind, randomized, active- (moxifloxacin) and placebo-controlled, parallel-group study in 189 healthy male subjects aged 18 to 45 years. Subjects received either RAPAFLO 8 mg, RAPAFLO 24 mg, or placebo once daily for five days, or a single dose of moxifloxacin 400 mg on Day 5 only. The 24 mg dose of RAPAFLO was selected to achieve blood levels of silodosin that may be seen in a â€œworst-caseâ€ scenario exposure (i.e., in the setting of concomitant renal disease or use of strong CYP3A4 inhibitors) [see Contraindications (4), Warnings and Precautions (5.3) and Clinical Pharmacology (12.3)]. 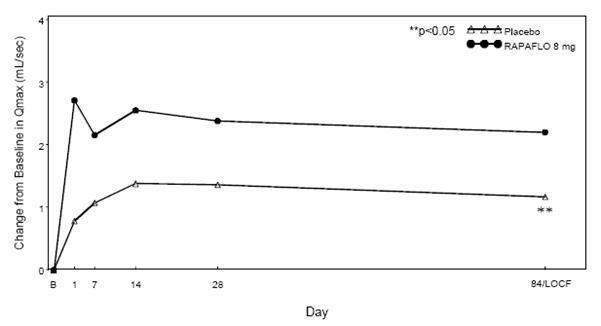 QT interval was measured during a 24-hour period following dosing on Day 5 (at silodosin steady state). 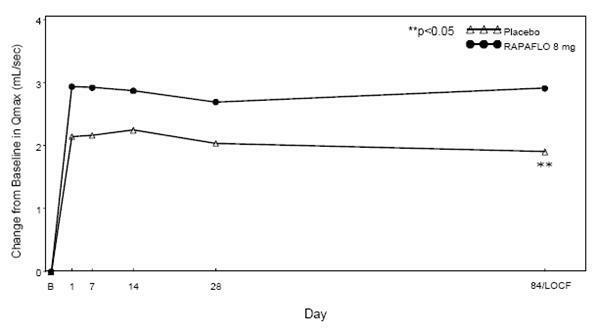 The pharmacokinetic characteristics of silodosin 8 mg once daily were determined in a multi-dose, open-label, 7-day pharmacokinetic study completed in 19 healthy, target-aged (> 45 years of age) male subjects. Table 3 presents the steady state pharmacokinetics of this study. 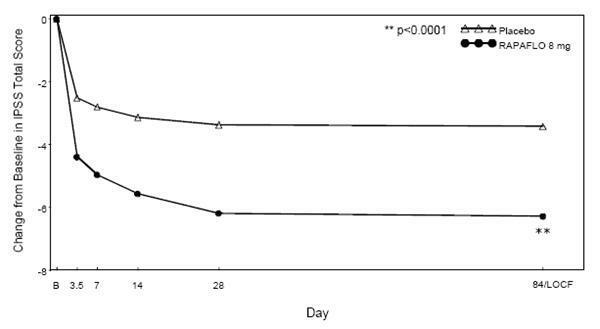 The maximum effect of food (i.e., co-administration with a high fat, high calorie meal) on the PK of silodosin was not evaluated. The effect of a moderate fat, moderate calorie meal was variable and decreased silodosin Cmax by approximately 18 âˆ’ 43% and AUC by 4 âˆ’ 49% across three different studies. In a study comparing 12 geriatric males (mean age 69 years) and 9 young males (mean age 24 years), the exposure (AUC) and elimination half-life of silodosin were approximately 15% and 20%, respectively, greater in geriatric than young subjects. No difference in the Cmax of silodosin was observed [see Use in Specific Populations (8.5)]. In controlled and uncontrolled clinical studies, the incidence of orthostatic hypotension and dizziness was greater in subjects with moderate renal impairment treated with 8 mg RAPAFLO daily than in subjects with normal or mildly impaired renal function [see Contraindications (4), Warnings and Precautions (5.2) and Use in Specific Populations (8.6)]. In a study comparing nine male patients with moderate hepatic impairment (Child-Pugh scores 7 to 9), to nine healthy male subjects, the single dose pharmacokinetic disposition of silodosin was not significantly altered in the patients with moderate hepatic impairment. No dosing adjustment is required in patients with mild or moderate hepatic impairment. The pharmacokinetics of silodosin in patients with severe hepatic impairment have not been studied [see Contraindications (4), Warnings and Precautions (5.3) and Use in Specific Populations (8.7)]. In a 2-year oral carcinogenicity study in rats administered doses up to 150 mg/kg/day [about 8 times the exposure of the maximum recommended human dose (MRHE) based on AUC of silodosin], an increase in thyroid follicular cell tumor incidence was seen in male rats receiving doses of 150 mg/kg/day. Silodosin induced stimulation of thyroid stimulating hormone (TSH) secretion in the male rat as a result of increased metabolism and decreased circulating levels of thyroxine (T4). These changes are believed to produce specific morphological and functional changes in the rat thyroid including hypertrophy, hyperplasia, and neoplasia. Silodosin did not alter TSH or T4 levels in clinical trials and no effects based on thyroid examinations were noted. The relevance to human risk of these thyroid tumors in rats is not known. LOCF â€“ Last observation carried forward for those not completing 12 weeks of treatment. B - Baseline determination taken Day 1 of the study before the initial dose. Subsequent values are observed cases except for LOCF values. LOCF - Last observation carried forward for those not completing 12 weeks of treatment. Note - The first Qmax assessments at Day 1 were taken 2-6 hours after patients received the first dose of double-blind medication. 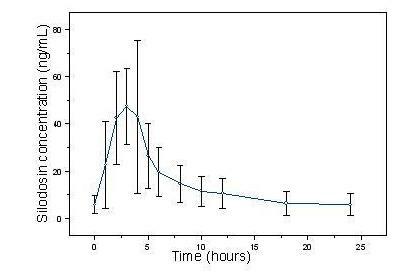 Note - Measurements at each visit were scheduled 2-6 hours after dosing (approximate peak plasma silodosin concentration). Patients should be instructed to take RAPAFLO once daily with a meal. Patients should be instructed about the possible occurrence of symptoms related to postural hypotension (such as dizziness), and should be cautioned about driving, operating machinery, or performing hazardous tasks until they know how RAPAFLO will affect them. This is especially important for those with low blood pressure or who are taking antihypertensive medications.